Tala, Paphos - This newly refurbished property in Lofos Tala is situated on a spacious corner plot in a quiet residential neighbourhood with little traffic passing by. 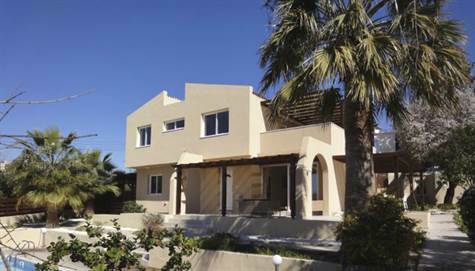 Paphos Town is a 10 minute drive, as is the International School of Paphos. The house is extremely spacious making a wonderful family home. On the ground floor is an entrance foyer, living room with patio doors accessing the outside verandas, a stylish modern kitchen and dining room, a double size bedroom with en-suite bathroom and a guest cloakroom. Upstairs are four double size bedrooms all with fitted wardrobes, two family size bathrooms and a large covered veranda with gorgeous panoramic sea views. The outside space is equally impressive with wide covered verandas on two sides of the property elevated above the large swimming pool with surrounding terrace. A combination of fencing and mature shrubs/trees ensures great privacy. An additional bonus is the corner annex with double size bedroom and en-suite bathroom, ideal for maid’s quarters or separate guest accommodation. This stunning home certainly has lots to offer in an area which is renowned for quality living. Full title deeds are available.